Crush the elderberries, put them in a glass jar and add the vinegar. Leave this in a dark cool place for 1 week. Strain the vinegar and cook it for 10 minutes. Add the sugar and dissolve it. Allow the vinegar to cool down completely. 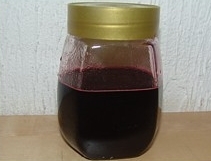 Put the elderberries and brandy together in a bottle and leave it for two weeks in the dark. Strain the brandy. Add half a cup of water to the sugar and heat it until it becomes a syrup; allow it to cool down to lukewarm. Mix the syrup with the vodka and the elderberry brandy.